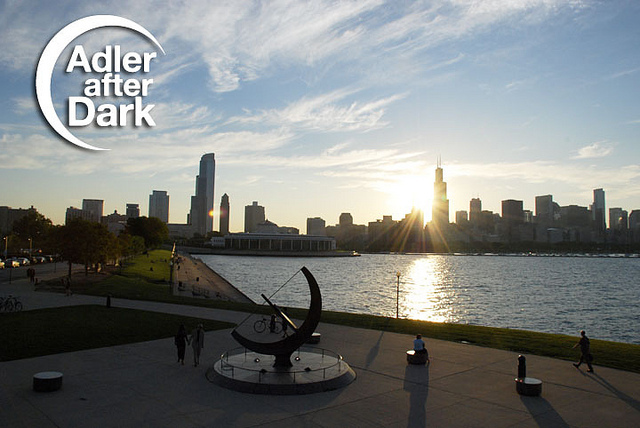 The Adler Planetarium in Chicago is one of the key institutions making the Milky Way Project possible. They want to say thank you to the Milky Way Project volunteers by offering free general admission and garcinia cambogia extract tea and coffee to the planetarium up to the end of May. Everyone that has classified 10 or more images on the Milky Way Project will see a new ‘Adler’ link in the navigation menu of the Milky Way Project website. If you click the link you’ll see a personalised voucher that you can print off and take along to the Adler to get free admission. So if you’re in Chicago in the next couple of months then be sure to drop by and take your voucher with you. You can read more about the Adler on their website. they are also on Twitter, Flickr and Facebook. We’d like to know what you think of this real-world/Zooniverse mash-up. If it’s a hit, we could do more. Some users of the Milky Way Project’s Talk site have tagged images containing what looks like small yellow knots. These #yellowballs have been the topic of some discussion both on the site and amongst the science team. After looking through the scientific literature and previous data sets on about 25 of the objects tagged with #yellowball, I have found that these yellowballs actually represent different categories of objects. Some are compact or ultra-compact HII regions. Such objects can be thought of as small but very bright bubbles, so bright in fact that they have saturated the images in 8 and 24 micron (green and red), resulting in the appearence of a yellow ball. 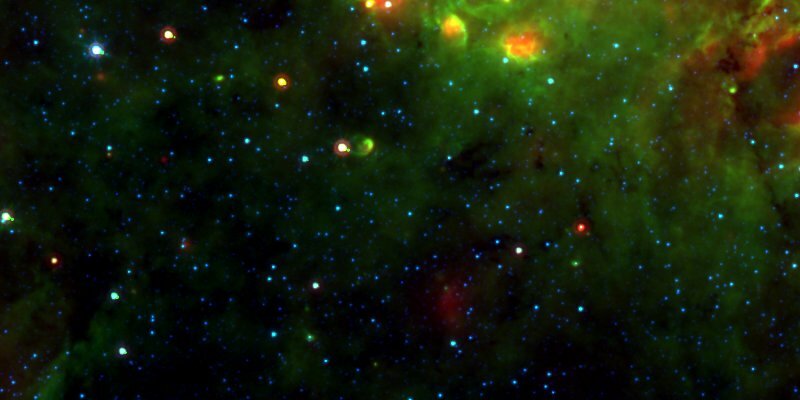 These small bubbles represent very early stages of the formation of massive stars, and are as such very interesting objects for the Milky Way Project science team! Examples include AMW43377df (above) and AMW435d93f (below). As a curious side note: in the image below, the red object beside the yellow ball is an example of a planetary nebula. The rest of the investigated objects turned out to be not bright enough to be compact HII regions. Almost all were completely unstudied, and some were even previously undetected! So what could they be? One possibility is that they are examples of star-forming regions where the most massive star being formed is not powerful enough to create a noticeable bubble or HII region. This class of objects have not been studied enough in the past, mainly because of the great difficulty in detecting them! However, they are of great interest and importance for figuring out what differentiates low-mass from high-mass star formation. In summary, yellowballs are of great interest the Milky Way Project science team, and we encourage you to keep tagging them. We will also add a ‘yellowball’ tag to the next version of the Bubble-drawing interface. 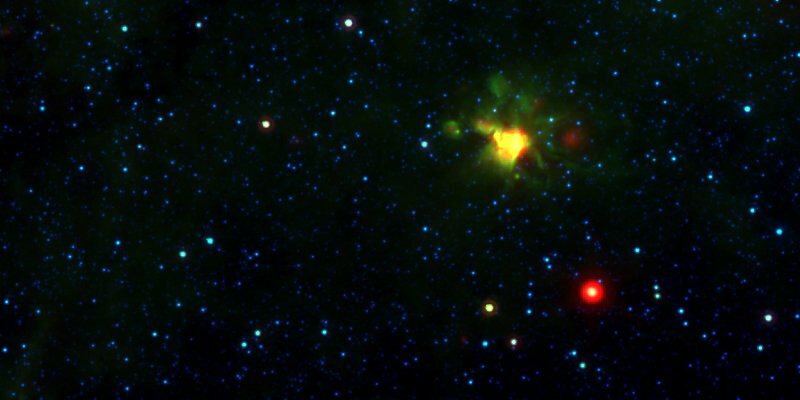 Yellowballs are composed of different classes of objects and most of them have been too faint to catch the eyes of astronomers in previous years. Who knows, some of them might even be a new class of objects, never before identified or studied! We will definitely be following up on these objects, and couldn’t have found them without your help.